My daughters 240D sat for a while and developed a algae problem. I cleaned the tank screen, quite a mess, and installed new inline fuel lines and main fuel filters. I added an algaecide and about 5 gallons of diesel to allow the algaecide to kill the algae. When that happens and algae settles to the bottom of the tank and looks like a layer of old wrinkly vinyl paint. It is not a solid sheet and will be picked up if disturbed. So I decided to take the fuel tank out and clean it with my pressure washer. If that did not clean it enough I would have it steam cleaned. Of course getting the fuel out will always result in diesel spilling on you no matter what you do. I also had to replace the fuel screen rubber line. Below are the pictures of the job. the hardware and the tank in and out. 1st. Remove the first aid kit and box from hat tray in rear seats. 2 philips head screws. Pull the plastic first aid kit front up and towards the front. 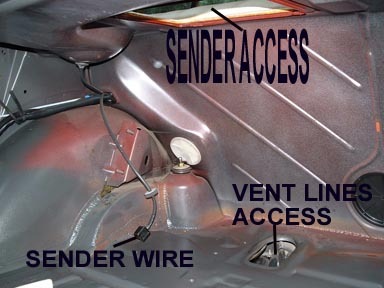 disconnect the sender wire and place out of the way. 2nd. Drain the fuel tank and plan on getting diesel on yourself. 4th. Unbolt the 2 vent lines under the tank on the drivers side of the car, get more diesel on yourself. 7th. Unbolt the forward trunk wall. 4 bolts 2 on the rear seat hat tray and 2 on the floor. 8th. Remove the vacuum reservior. 1 push pin assembly at the rear on the rear seat hat tray. Disconnect the vacuum line and move to the side. 9th. Unbolt the 4 fuel tank mounting nuts, remember the large washers are on the top. 10th. 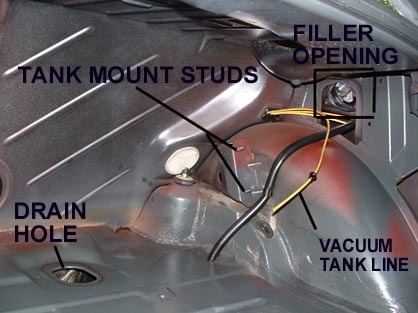 remove the tank by moving the driverside towards the rear first and sliding the filler neck out of the body opening. spill more diesel on yourself or the trunk. 11th. remove the fuel screen and sending unit. 12th. Clean with a high pressure washer or take it to a radiator shop to clean it. 13th I attached my shopvac hose to the filler neck and duct taped it tight. then I turned it on blow and allowed the tank to dry this way for 4 hours. Make sure the vent lines are empty of water. This may require rotating and moving the tank to get the lines to drain. I used a flashlight to see into the tank and it looked quite clean. 14th Before reinstalling the tank, blow out the supply and return line and change the filters. 15th Use an algaecide every 6 months. 16th OK you had an algae problem and had to do all this work. Since your there consider the following. Clean the screeen completely, I used brake cleaner in a can. Replace all the rubber lines you had to disconnect. You may have to reglue the bottom rubber cushions on the tank back on, use 3m weatherstrip adhesive. Open and clean the sending unit. If the tank had a algae problem so does your sending unit. Again brake cleaner spray. New screen and sender Orings. New filler rubber bushing if your is worn. 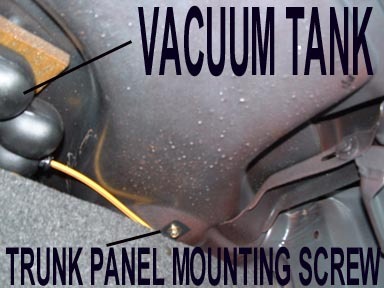 Check your vaccum reservior, If cracked or leaking repair with epoxy. Check the vacuum line to reservior connector. Seal or replace if its bad. Your under the rear of the car so check everything. I treat the axel boots with 303 preservative while I'm under there, be careful not to break the boots if they are old. Again if you are doing this consider using an algaecide every 6 months or so. 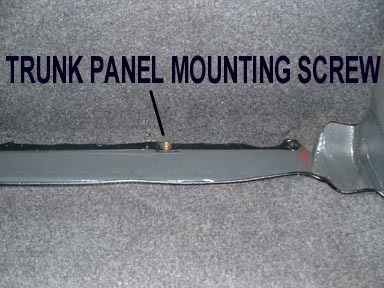 The first picture shows the mounting bolts for the trunk wall panel ( this shows the lower one) . There are 4 bolts total. 2 under the hat tray of the rear seat ( accessed from the trunk side), and 2 on the floor of the trunk. 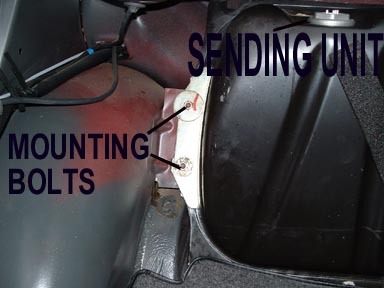 Access for all 4 bolts is in the trunk. Last edited by dmorrison; 04-27-2004 at 02:23 PM. Last edited by dmorrison; 04-27-2004 at 02:12 PM. This is is what the water looked like that was drained out of the tank while high pressure washing the tank. And if anyone knows how to get the diesel smell out of my shop clothes, without a match, let me know. 3 washings and they still smell. Last edited by dmorrison; 04-27-2004 at 02:29 PM. This is probably the one caveat to buying a really low mileage diesel driven by the little old lady from Pasadena. The chances of it having an algae problem rise. Outstanding pictures and write-up! As to the clothes, hang 'em outside and let the wind blow the stink off them, as my grandmother used to say. Just gonna take time and washing to get it out completely. Dave, the TSP is great. But Tyvek coveralls are wonderful! I get them for $3.99 each at Chief Supply. Last edited by Rick Miley; 05-04-2004 at 09:19 AM. Time to think of those dirty jobs again. so i succeeded in getting scolded for spilling a bit of diesel on the sidewalk..
but the reason i took out the tank was becuase there was fuel leaking into the trunk and actually pooling there.. i'd mop it up and it'd slowly get worse. the vent and the return line was totally dry. the filler neck was somewhat damp with fuel underneath, the rubber boot on the filler neck was partially destroyed, the spilled-fuel dump line was soaked but appeared intact (the line that runs through the trunk space and empties out stright down, in the wheel well). a week ago, when i found this problem initially, i looked underneath and found the fuel tank output hose (the rubber hose part with the metal gasket that connects to tank filter head to be totally soaked, but the tank filter head itself, and where it contacts the metal of the tank, to be totally dry. so i ruled out its o-ring. but the fuel output hose was cracked, and when i replaced it and drove another 600 miles, it stayed dry. however, the leak to the trunk persisted. so the question is this: does the leak have to be on the filler neck, in order for there to be fuel there? the tank cap o-ring looks fine. it doesn't look like it's running down there and causing the mess in the trunk - could it run even though it appears to be only damp? is there another seal down at the bottom, besides the filter's o-ring and the output hose? it even looked pretty wet near the right two bolts holding the tank in place: could the tank itself be leaking where the two halves meet? 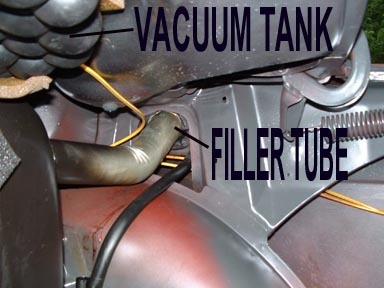 (the tank consists of two moulded halves welded or otherwise glued together i looked hard but nothing more than the vague dampness that covers the whole bottom and right side (standing behind the car) of the tank, including the bottom of the filler neck. 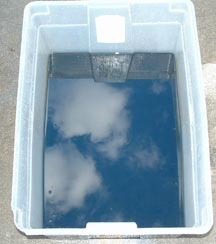 the tank filter was covered with an even coat of black stuff, but was not clogged. i can't tell to what degree this black stuff covers the inside of the tank.. at least the bottom of it. it's not green, anyhow - is it algae? the fuel appears to have a greenish-red tint (impossible i know, but when i shine a light inside, i see both colors). i put is some dieselkleen, i dont know if that could cause change in color. how can i determine if the tank itself is leaking? how can i fix it if it turns out to be? yes this is an original Granny D garaged '81 240D, which i am proceeding to gut and probably go for SVO. free and harmless fuel is ok with me. Last edited by jeffl; 02-05-2005 at 02:07 AM. Or you could just clean the entire inside really really well ( and block off the necessary openings ) and use a liquid gas tank sealant in it.